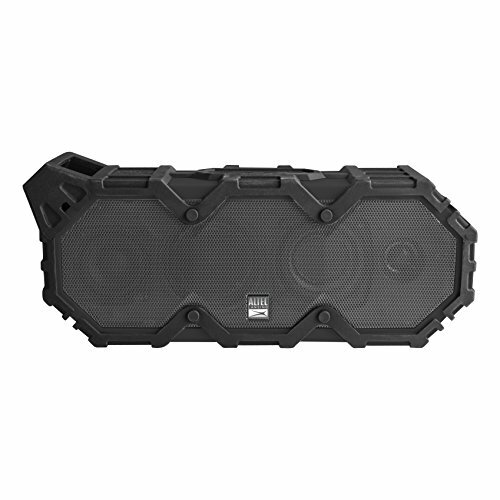 Altec Lansing's new LifeJacket XL is the lastest and greatest addition to the everything-proof line of Bluetooth speakers, with the ultra-rugged look and feel that you want in any outdoor speaker. This speaker boasts an IP67 waterproof, shockproof, snowproof - and it FLOATS! rating. With with it's new House Party mode; it can pair with up to 50 other Altec speakers over Wi-Fi or Bluetooth for the party of a lifetime through Altec Lansing's Connect app! The LifeJacket XL will keep the tunes blasting from up to a 100-ft wireless range for up to 40 hours! With a built-in smartphone charger, not only will your speaker keep up but so will you! Pair and play with your Bluetooth device with 100 foot range. 40 hours battery life. BUILT-IN MIC for handsfree speakerphone from Smartphones and iPhones. Micro USB and AUX cable. Waterproof, Dustproof, Sandproof, Everything proof, Floats; outdoor shower speaker, perfect for the beach, poolside, car, boat, golf cart. ULTRA PORTABLE; designed to be comfortable to carry, so much better for travel & hiking, superlight and easy to fit in your backpack baggage. CONNECT OVER BLUETOOTH IN SECONDS to: iPhone, iPad, iPod, Mac, Smartphones, Tablets, Windows 10 ---- To play from Chromebooks, Windows 7-8 systems, TVs and non-Bluetooth devices use the included 3.5mm audio cable connected to the AUX-IN jack. Warranty: ALL speakers are backed by a no charge 1 year warranty.